“Mom, I wanna be a cat,” my daughter said, the year we saw the musical, Cats, on Broadway. Marika loved dressing up. Halloween was her favorite holiday, and every year I’d sew gowns and paint her face. She’d sit stock-still-serious with only her eyes roving, occasionally meeting my own eyes as I painted whiskers or pink clouds of rouge across her pristine porcelain cheeks. There were only a couple of years out of twenty that I did not transform her into a fairy princess, a garbage-monster, a witch, a genie…. After she died, it took a long time before I was able to apply makeup or wear a costume myself. Saturday, friends invited me to carve pumpkins. The same friends had had my family over for holidays since our children were little. But four years out from the death of my daughter, my heart still sputtered when confronted with holiday traditions. “Do you remember if we carved pumpkins when you were a kid?” I asked my son, hoping to extend the invitation. “Mom, I’m sure we carved pumpkins,” he said, and buried himself under his blanket, uninterested. Alone, I joined my friends and two of their grown children, aware that I had only vague memories of drawing faces on pumpkins. The old familiar kitchen table was covered with pumpkins, bowls for the seeds and scrapings, and tools for cutting and scooping. After drawing on the bumpy orange surface with Sharpie markers, I picked up a tiny serrated pumpkin-carving knife. “How cute,” I said, turning it over in my hand. That’s when I realized I had no idea what to do next. Someone else had always taken over for me at that point. Squeamish around knives, I’d always let a husband, or a friend, or a friend’s husband do the carving. But now, my friends were busy with their own projects. With quivering hands, I made a hesitant stab and started to saw. Before long I surprised myself, gouging and sawing the pumpkin’s flesh with vigor. I carved my own pumpkin. I am free, I thought. I’m strong. I can do this. No one would need to carve for me ever again. Maybe I could even carve a Thanksgiving turkey. Last year I wore a costume. This year I carved a pumpkin. Who knows what I’ll be able to do next! But I’m pretty sure I’ll never, ever be able to paint on a child’s face again. Cheers to my friend’s son Andrew whose cat-pumpkin was much friendlier than my own. What stresses you about Halloween? How have you surprised yourself lately? 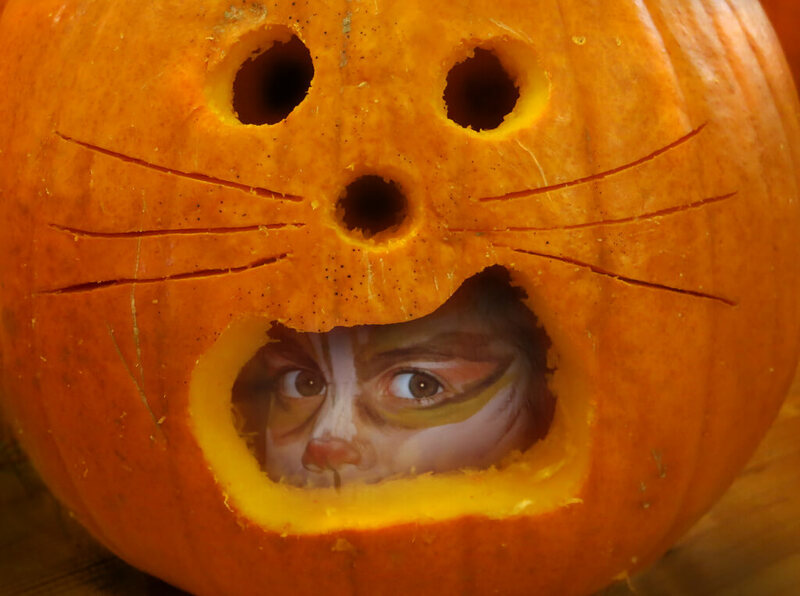 This entry was posted in 2015 and tagged carving pumpkins, challenging oneself, Coping with Halloween, face painting, grief, Halloween costumes, holiday stress, stressed out for halloween, survivng holidays on 2015/10/26 by Robin Botie. The image is fantastic, Robin. Thanks for sharing the beautiful sad memories of Halloween’s past. No wonder it’s a hard holiday for you. Sending love and appreciation. Thank you, Elaine. It’s funny how the silliest of holidays can be the hardest. Love and appreciation back atcha. Hugs! Cheers, Nicole. You too. Go, my friend. I hope you’re enjoying your world. So great to hear from you. Thank you so much, Nancy. And welcome to my online house. And thanks so much for the image you’ve put in my mind of dressing your young Billy up to be an old man with Karo syrup and oatmeal. Yeesh – that musta been a mess to clean him up after. You get first prize for making me laugh on my own blog. Cheers! Wendy, you really know how to make me glow. Cheers, bunny girl. It’s an honor to have you as a friend. Halloween just makes me nostalgic remembering trick or treating with our son in my mother’s neighborhood each year. He had some awesome costumes and I love remembering some of the best ones. What have I done by myself lately? Since spring this year I’ve gone several places alone and been “ok” with it, out to breakfast and lunch alone, church alone most weekends. Baby steps for me, but big steps in the long run 🙂 Love the pumpkin picture. That’s all living is, I think. Baby steps. One foot in front of the other. It all adds up though. I, too, am getting more comfortable with going out alone. Breakfast out is one I have yet to try. Cheers, Jo. I had a feeling that bright orange might get you excited. Thanks, Annette. Loved the post! Loved the picture also. Hope next year you’ll look forward to carving pumpkins with us instead with happiness and excitement. We’ll even provide some pumpkin carving food. I am SO thrilled to have you on my site. And responding. Thank you so much. You know I love coming to your place with or without the food. And now I’ll look forward to the carving because I have been empowered. Might even bring my own tools to carve with. Cheers!